In the Near Future, 2005–2009. School of Art faculty member Sharon Hayes is the subject of a solo exhibition at the Art Institute of Chicago, through March 11, 2012. This presentation, the first solo museum exhibition of Hayes' work in the United States and the 27th installment of the Art Institute of Chicago's focus series, includes several recent media and object-based installations as well as a live performance. 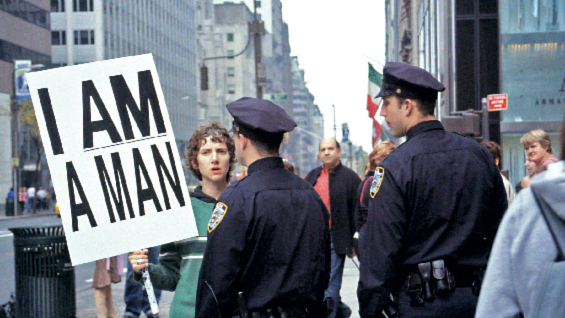 In the Near Future (2005–2009), part of an ongoing project examining the political construction of speech in public space through the figure of the protester and the protest sign, consists of over 350 slide images that document a series of performances that Hayes conducted between 2005 and 2008. Parole (2010), which debuted in the 2010 Whitney Biennial, is a four-channel video installation that continues Hayes’s investigation of the public and private voice through a central character who records sound but never speaks. The exhibition also features An Ear to the Sounds of Our History (2011), a new series of works that draws upon the artist’s vast archive of spoken word vinyl records including speeches by John F. Kennedy, Martin Luther King Jr., Malcolm X, Eldridge Cleaver, Angela Davis, Jackie Kennedy, and Eleanor Roosevelt. Grouping the album covers into “sentences” of varying lengths, Hayes looks at the systems of distribution that have determined whose voices predominate and whose have been all but forgotten to history. A related live performance, Spoken Word DJ, in which Hayes mixeed and sampled the original records, opened the exhibition on November 10, 2011.